I saw this movie just for this scene. I have no idea where to begin with Troll 2, the 1990 horror movie that sparked the viral YouTube video containing the clip of Arnold (Darren Ewing) expressing his horror at the prospect of getting eaten by trolls–I mean goblins. It’s up to their son Joshua (Michael Stephenson) to keep those he loves from turning into vegetables and getting eaten by (apparently vegetarian) goblins. Most other reviews have covered to death issues like the unconvincing goblin costumes; the goblins look like children wearing potato sacks and non-moving masks. For that reason, I’ll try to avoid talking about technical issues. Troll 2’s writing was easily on par with that of The Happening, which was a movie I walked out on 10 minutes in. Somehow, I forced myself to get through Troll 2 (albeit oftentimes while surfing the Internet while the movie was on in the background). Where Troll 2 has an excuse that The Happening didn’t was that Troll 2 was written by Claudio Fragasso, an Italian who didn’t speak a word of English. Where it didn’t have an excuse was that Fragasso, like many B-movie directors, insisted that his actors say the lines exactly as he wrote them. What resulted was some very awkward dialogue. The scene that comes to mind was early on in the movie, when Josh’s sister (I’ll be damned if I can remember her name) gets a visit from her boyfriend. She punches him in the groin, to which he responds, “Are you trying to turn me into a homo?” I’m aware this movie was from 1990, and thus it was a time when it was still considered ok to be homophobic, but I still felt like it was an inappropriate response to the context. In that same scene, the sister proceeds to compare her boyfriend to involuntary celibates, which I personally felt to be a little below the belt. The plot trundles along to a climax where the trolls (sorry, goblins) are vanquished when the family, with the power of their goodness, touch a stone. The demise of the goblins didn’t really have an effect on me, or on the cast for that matter. Throughout the movie, nobody found the green slime on their food to be in any way suspicious. The movie also broke its own rules with Grandpa Seth. At first he was an apparition who only appeared in Joshua’s visions, but gained the ability to interact with the physical world about halfway into the movie. I’ve seen student films which were much more well-made than this. 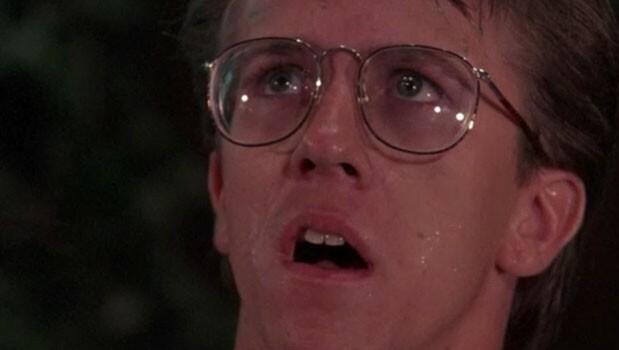 Troll 2 had clumsy writing, acting which you would expect from a dentist (by the way, one of the actors was in fact a dentist), and production values that could have been paid for by a high school cheerleader fundraiser. Troll 2 sits on its very well-deserved spot as number 99 on IMDb’s bottom 100 and has a very well-deserved reputation as being one of the worst movies ever made. ← Their Reasons for Doing it Are Obvious. Their Methods Make Me Want to Hit Them.